If you're a commercial printer, you need the right screen printing supplies, and one item that you're likely to need is a spray gun. While shopping for spray guns, you may want to keep the below listed tips and ideas in mind. Most spray guns are used for spot cleaning. Some spray guns are hand powered. You simply pump the handle to get them to dispense, but others connect to hydraulic systems and offer a range of different power ratings. For instance, you can get spray guns with 110 volts or 220 volts. Ultimately, you need to decide what's right based on your budget and how powerful you want the tools to be. 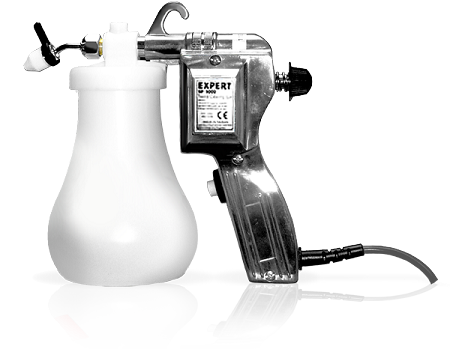 While choosing spray guns, you may also want to think about how the gun is going to feel in your hand. The most popular design features a curved bottom with an indented middle. That creates comfort for your hand. 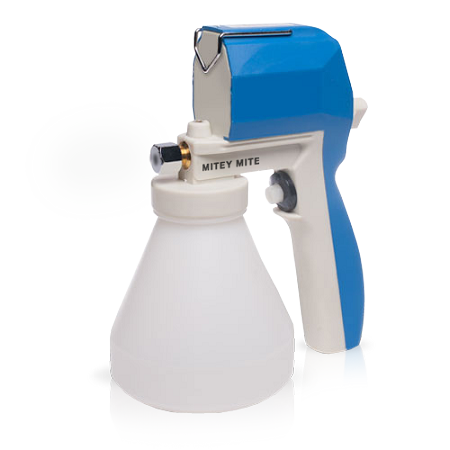 However, there are also spray guns which have a straight cylinder shape. In addition to looking at the shape of the bottle, you may also want to think about the shape of the handle that you squeeze. Some handles are relatively straight, while others have slight indentations for your fingers. 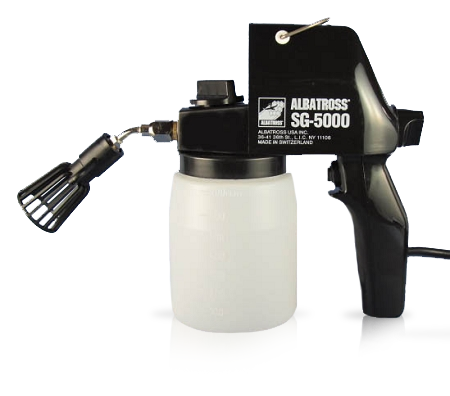 In addition to buying a spray gun, you may also need to invest in a few accessories. There are adjustable nozzles that let you change how much pressure is coming out of the bottle. There are e-rings, pump pistons, adjustable rools, and nozzle heads as well. You can even buy new cables with plugs if needed. 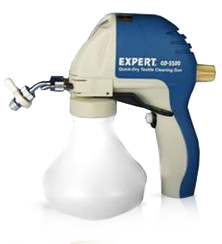 In some cases, you may need to buy these products if your spray gun fails or needs a repair. However, some busy printing shops stock up on these items in advance. Then, if they need a replacement part, they have it on hand and don't have to worry about a lull in production. Ultimately, you will need to store the spray guns when they are not in use. You may want to keep their size in mind as you shop and make sure that it works with your storage areas. Beyond that, you may want to invest in a gun hanger pulley. That lets you essentially hang your spray guns from the ceiling so that you can easily access them as needed. To remove smudges using a spray gun, you shot a high-pressure jet of cleaner at the fabric. The spray gun contains special spot removing chemicals, and once they hit the shirt, they start to break down the inks. They tend to work the best on porous fabrics such as cotton or woven polyester. Depending on the ink you use, you may need to choose different types of spot cleaners. Some options are better for water based ink while others help to remove plastisol ink. 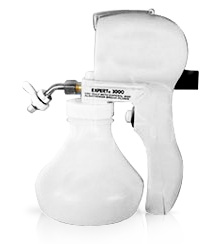 The main benefit of a spray gun is that you can refill it numerous times. In contrast, if you buy spot cleaners in aerosol cans, you simply have to throw out the can after every use. Those cans can be ideal if you want to try a new spot remover or if you have limited need for cleaners. But for long term use at high volumes, spray guns tend to be more effective. To see more screen printing supplies and spray guns, look through our site. If you have questions, contact us directly.